75 Years of ChildFund Sponsorship! 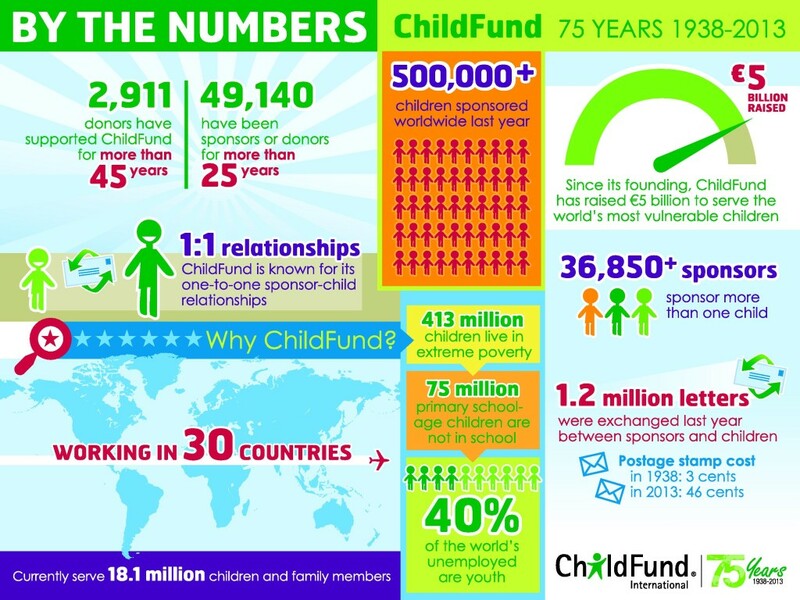 ChildFund by the numbers – it’s been quite a journey! Whilst ChildFund Ireland may not have been going quite so long – we were founded in our original form in 1991 – we are rightly proud of the contribution our supporters here in Ireland make. Together, we reach over 3,600 children through child sponsorship. Last year alone we processed over 45,000 payments from the Irish public. Your generosity contributes over €1.1 million to help children in 12 developing countries to access education and health services, to learn about their rights and enjoy new opportunities as they grow up. A further €675,000 from Irish Aid and Irish Corporations helps to fund community programmes and projects that mean thousands of children have the hope of a better future. You Are Here: ChildFund Ireland > News > 75 Years of ChildFund Sponsorship!